Wrong FW version in latest Linux x86_64 GUI? I'm attempting to run the Flirc GUI version 3.20.2 on Linux (Ubuntu) on my first generation Flirc. The log says that I need FW of >= 4.1.0. I don't wish to risk messing up the stored key settings if the upgrade isn't going to work. Is the GUI message wrong or is the version it is going to install too old? 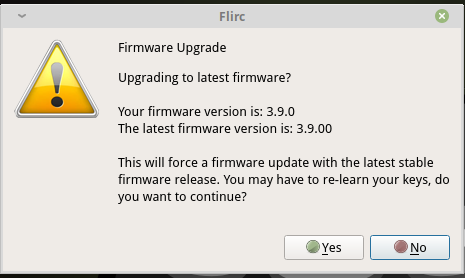 Running Flirc GUI version 3.20.4 on Linux 64bit (Mint 19) first generation of Flirc. How to upgrade to 4.1.0 first ?? For your reference: The working version that I installed was the 64 bit generic tar file. I did not use the apt install script. have the same problem as @SteLin. I also tried the 64-bit generic tar file without success. The upgrade tool will not install any firmware >= 4.1. It offers me only the already installed version 3.9.0.